Angkor Thom seems not to be the first Khmer capital on the site, however. Yasodharapura, dating from three centuries earlier, was centred slightly further northwest, and Angkor Thom overlapped parts of it. The most notable earlier temples within the city are the former state temple of Baphuon, and Phimeanakas, which was incorporated into the Royal Palace. The Khmers did not draw any clear distinctions between Angkor Thom and Yashodharapura: even in the fourteenth century an inscription used the earlier name. 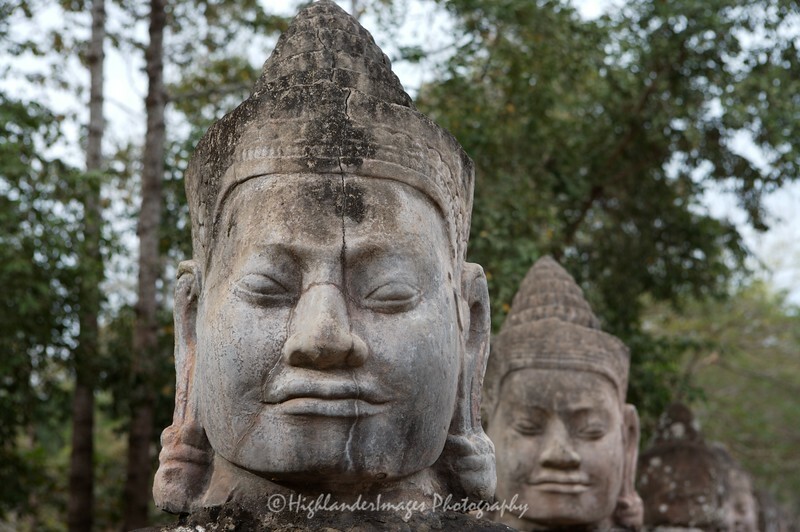 The name of Angkor Thom — great city — was in use from the 16th century. The last temple known to have been constructed in Angkor Thom was Mangalartha, which was dedicated in 1295. Thereafter the existing structures continued to be modified from time to time, but any new creations were in perishable materials and have not survived. In the following centuries Angkor Thom remained the capital of a kingdom in decline until it was abandoned some time prior to 1609, when an early western visitor wrote of an uninhabited city, "as fantastic as the Atlantis of Plato" which some thought to have been built by the Roman emperor Trajan. It is believed to have sustained a population of 80,000-150,000 people.